1. Terry Fox. He became famous for the “Marathon of Hope”, a cross-Canada run to raise money for cancer research. But here’s the kicker, the amazing feat was done with one prosthetic leg. He’s a Canadian hero and the Terry Fox Run continues to this day as one of the world’s largest one-day cancer fundraisers. 2. Any Canadian Beer. 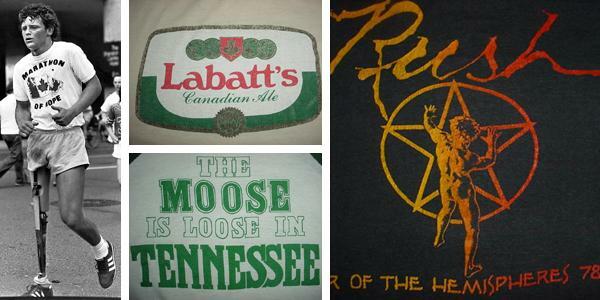 They are stronger than beers brewed in the U.S. of A, so beer shirts created north of the border must be better. Moosehead, Molson and Labatt – get it on you and then get it in you. Feel no shame for your beer belly when the culprit responsible for your mid section molasses is advertised inches above. 3. Rush. If you call yourself a fan of the rock AND the roll, your shirt collection must represent at least one band from every country in the world. And yes, even the really tiny and obscure countries like Mypos (Repect to Balki Bartokomous) and Canada. Lead singer Geddy Lee appeared on a Bob and Doug McKenzie album – with a single called, “Take Off” which paid homage to the classic SCTV skit, “The Great White North.” You can’t get any more Canadian than that.